You always need a login to authenticate yourself and access your personal information, portfolio pages and groups that you belong to. You can log in on the Mahara homepage. Username: Type your username in this field (not for SSO or Moodle accounts). Password: Provide your password. If you enter your password incorrectly 5 times in a row during one session, access is locked for 5 minutes before you can try again. Click the Login button to access your account. Lost username / password: If you do not remember your username or password to your account, click this link to be taken to a page where you can request an email with your details. It will contain your username and a link to change your password. Register: If you do not have an account, and your institution allows self-registration for an account, use this link and follow the instructions on the next page. SSO login: If you log in via your institution’s SSO (single sign-on) account, please use this button to be taken to the SSO login. The regular login form is only available for internal and LDAP accounts. Internal accounts are accounts for which you registered through your Mahara site or that were created by administrators either manually, or by a CSV file upload. The “Lost username / password” link only works for internal accounts where you use the regular login form. If you log in via SSO or Moodle for example, you must retrieve your password directly from these services. If you do not know how to do that, please ask your administrator. You only see the SSO buttons if SSO has been been enabled on your site for at least one institution. Persona authentication is not available anymore because Mozilla dicontinued it. You can migrate any existing Persona accounts to internal authentication. 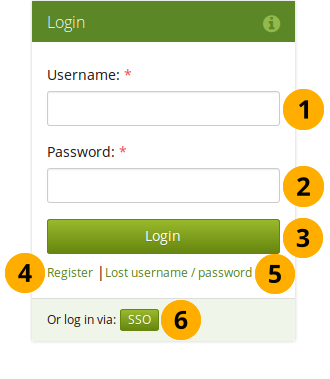 You can hide the login form entirely from the homepage if your Mahara instance generally only connects to an external authentication method such as MNet or CAS. In these cases, your users will need to log in via a different site and seeing the login form on the homepage may only be confusing. Once you have hidden the login form, only a link to it is displayed on the homepage for an administrator to log into the site. After you successfully logged in to Mahara, you see your Dashboard. 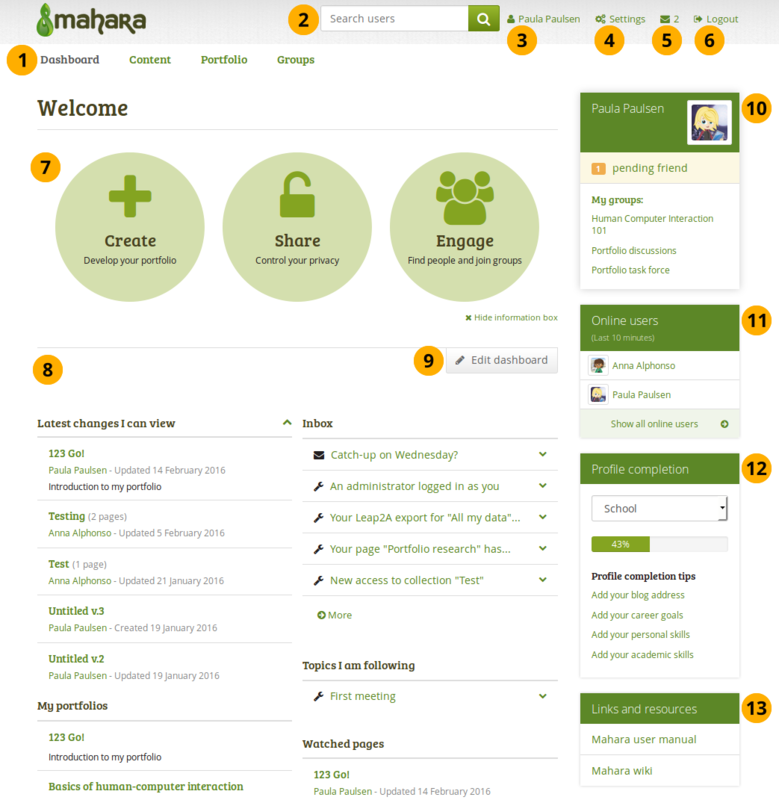 This is your homepage where you can see the latest activity of you and other users on Mahara. You can customise the dashboard so that you always see the items that are most important to you. Only you can see your dashboard. Nobody else has access to it. You can change certain aspects of your dashboard, namely the user-specific information, but a lot of what you see is static to allow you to quickly access other parts of Mahara. 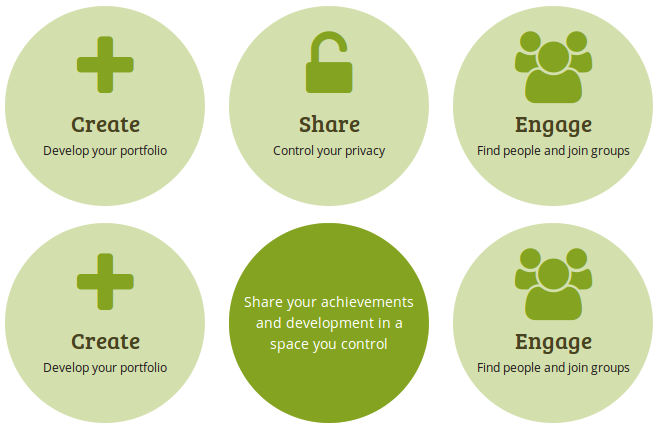 Your homepage is your dashboard from which you can access a number of areas in Mahara conveniently. General navigation bar: Move from one area of Mahara to the next. This can be done by having a second-level navigation that is tabbed or a drop-down menu. Search: Search for users who have an account to view their profile page and check which pages they have made accessible to you. If your site has fulltext search available, you can search for anything on the site using this search box. In the User search box you can most often search for users’ display name. Depending on the settings that the site administrator made, you may also be able to search for users’ real name and username. If the site administrator allowed users to hide their real name, you can do so in your general account options. To provide you with the most relevant search results, you automatically search only for users within your own institution, but can choose to search for everyone on your Mahara installation on the “Find friends” search page you are taken to. If the site administrator turned on exact user search, you need to provide the correct display name or real name in order to find another user. Your name: Your name is displayed to indicate who is logged in esp. when viewing portfolio pages where the profile block is not visible. You can click on it to go to your profile page. If an administrator masquerades as another user, this name helps to check quickly, in which account actions are undertaken. Settings: This link gives you access to your account settings and notifications. Inbox: Go to your Mahara inbox to check for new messages. When you have unread messages, the counter displays the number of unread messages. Logout: Link to log out of your current session. Quick links: These quick links take you directly to certain areas of Mahara. User-specific information: You can customise this area on your dashboard to put blocks there that you want to see every time you log in. Edit dashboard: The Edit dashboard button allows you to jump directly into the edit screen for your dashboard without having to go to Portfolio → Pages first. You cannot add a skin to your dashboard page. Your name is linked to your profile page. Your profile picture is linked to your profile pictures page for easy uploading of new profile pictures. If you are a member of any groups, they are displayed here. Pending friend requests and group invitations are displayed. If you tagged artefacts or pages with the tag “profile”, a link to them is placed here. Online users: If this sidebar block is enabled, you see users who have been logged in during the last 10 minutes. Depending on the settings for your institution that the administrator chose, you may see all users, only users from your institution(s) or no users at all. Profile completion: You see this sidebar block if your site or institution administrators turned on the profile completion functionality. Links and resources: List of links to websites or documents that are visible to all logged-in users or the public. Create: Create your electronic portfolio in a flexible personal learning environment. This takes you to Portfolio → Pages. Share: Share your achievements and development in a space you control. Clicking on this box takes you to Portfolio → Shared by me. Engage: Engage with other people in discussion forums and collaborate in groups. This takes you to Groups → Find groups. With the help of these quick links you can reach the different parts of your portfolio directly from your dashboard. If you removed these boxes from your dashboard but want to get them back at a later point, you can re-active them under Settings → Dashboard information. If you do not see the dashboard boxes and do not have the option to turn this setting on, your site administrator disabled this feature in the site configuration. next to the dashboard page and change the blocks like you would change them on any page in Mahara. Refer to the page editor for more information on adding and removing blocks from a page. The site administrator can change the default blocks on the dashboard page for new users in Administration → Configure site → Pages.